Are you searching for Faculty Teachers Rajasthan 2019? 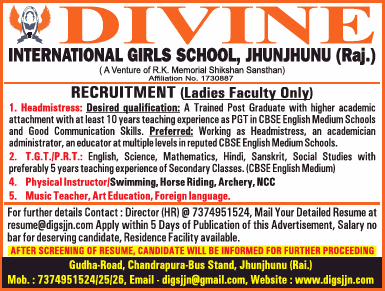 A School based in Jhunjhunu named Divine International Girls School, Jhunjhunu has advertised in THE TIMES OF INDIA newspaper for recruitment of Teachers TGT / PRT / Headmistress jobs vacancies. Interested and eligible job aspirants are requested to apply within 05 days from 27th March 2019. Check out further more details below. About School : The infrastructure is peerless and outcome of the pure thinking out of the box. The concept is designed with insight to facilitate the students with all modern amenities such as pollution free lush green 82-acre campus, Wi-Fi net connectivity, Swimming Pool, Cricket Ground, Athletics Track, spacious playgrounds and A.C Hostel. The school is advancing towards providing an international standard of education.